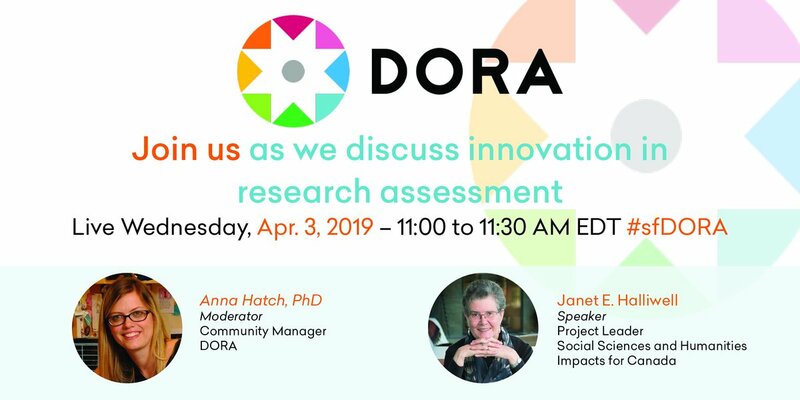 DORA community interviews provide an opportunity for supporters to discuss good practices in research assessment and to better understand how to initiate effective change in local communities. This time we will talk with Janet Halliwell, who helped develop the 2017 report, “Approaches to Assessing Impacts in the Humanities and Social Sciences,” that was released by the Federation of the Humanities and Social Sciences in Canada. Interviews are a combination of questions asked by the DORA community manager and other community members on the call. The half-hour interview will take place as video conference using Zoom webinar. You will receive additional information before the event. Please contact info@sfdora.org with any questions.